Easy BBQ Chicken Ring Recipe - Chicken lover must love this recipe, people who love to enjoy chicken with new styles they will love it. BBQ recipe with easy way. 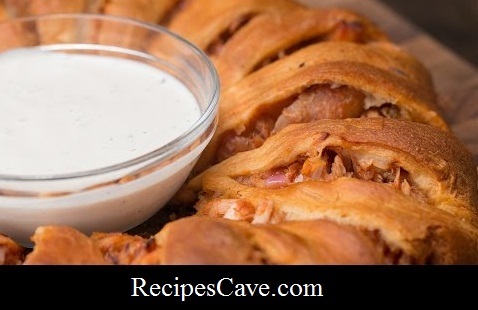 Follow these simple steps to cook Easy BBQ Chicken Ring. 1. Preheat oven to 375˚F/170˚C. 2. In a large bowl, combine shredded chicken, red onion, and BBQ sauce. 3. Place a small bowl, filled with mozzarella cheese, in the middle of a greased baking pan and arrange crescent dough triangles around the bowl with the smallest angle on the outside. 4. Sprinkle ½ of the cheese along the inside of the ring and spoon BBQ chicken mixture on top of the cheese, also in a circular shape. Top with the rest of the mozzarella. 5. Lay the top of the triangle over the filling and repeat until the all of the triangles have been wrapped around the filling. 7. Cut into pieces and serve with choice dressing in a bowl in the middle. Your Easy BBQ Chicken Ring recipe is ready.